I captured this image on a recent trip on the Rhine from Basel to Amsterdam. Nearing the journey’s end, we left the Rhine for the Waal. This bridge is located in Zaltbommel, The Netherlands, and is named for the Dutch poet Martinus Nijhoff. Nijhoff is remembered for his poem The Wanderer. Appropriate for a photo challenge titled “On The Move”, isn’t it? You’ll find links to other’s contributions to this week’s challenge at the Daily Post. >I haven’t “officially” joined ExLibris’ Soup’s On! Challenge but after reading Emily’s recent post on her experiments with Indian cooking — and a trip to the Farmers’ Market this morning — I thought I’d play along in spirit with this post. Farmers’ Markets recently have become a big thing in my town. There are now two markets on Saturday either close to my home, or on my usual Saturday errand route. This morning, when I went for an early morning walk with friends, we walked to one of these markets. Today’s market was crowded at the opening bell with joggers, bikers, dog walkers (and their dogs), young and old alike strolling past the 20 or so stalls selling a variety of local, fresh goods. At this time of the year, there are plenty of herbs, flowers, and garden plants for sale, but there isn’t a lot of fresh produce at the markets. Asparagus is in season and it looked yummy. In addition to my usual purchase of shitake mushrooms, I bought some lettuce and a bottle of deliciously creamy yogurt from a local dairy whose products are organic & their cows are grass-feed. And, in an impulsive move, I bought some rhubarb. I don’t buy rhubarb often. I think I heard the Prairie Home Companion folks singing Rhubarb. Rhubarb. Rhubarb pie! 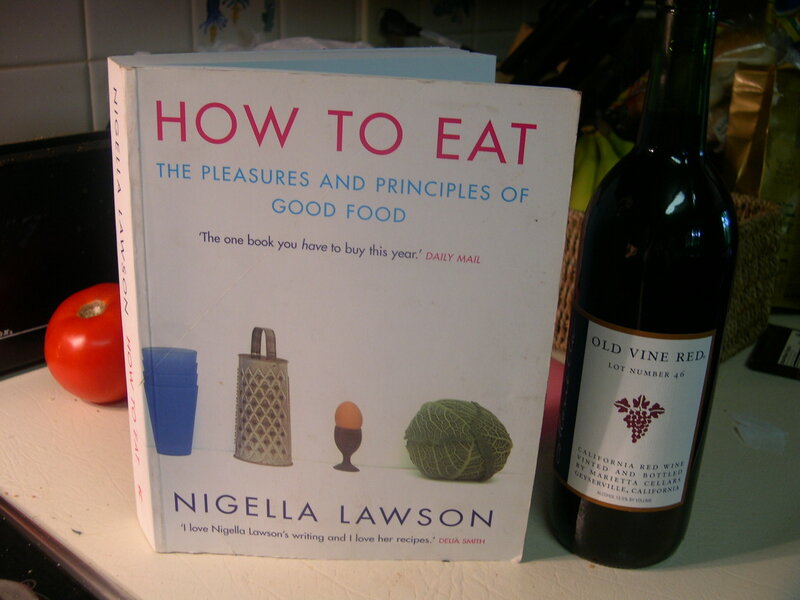 I wasn’t even sure how to prepare it, so I went to my cookbook bookshelf and pulled out a favorite book, Nigella Lawson’s How to Eat: The Pleasures and Principles of Good Food. I didn’t realize that rhubarb is one of Nigella’s favorites. Had I been so inclined, I could have made a rhubarb fool, rhubarb custard, rhubarb ice-cream, a jellied dish, a trifle, a tart, or an almost irresistible steamed pudding called, memorably, Pig’s Bum. Instead, I decided to make a Rhubarb Crumble. About 10 years ago, I started buying cookbooks whenever I traveled. This version of How to Eat, which is also available in an Americanized version, is one I picked up on a trip to London a few years ago. The challenge for me with this book: because it is British, the measurements are in metric. Being the ignorant American that I am, I can’t easily translate the measurements. Since most European cooking measures dry ingredients by weight instead of volume — which really is the logical way to do it — this book presents another challenge. Try converting 120g to cups. There isn’t a formula for that. But, I have a new kitchen scale so I didn’t even bother. All metric for me on this one, baby. Well almost! 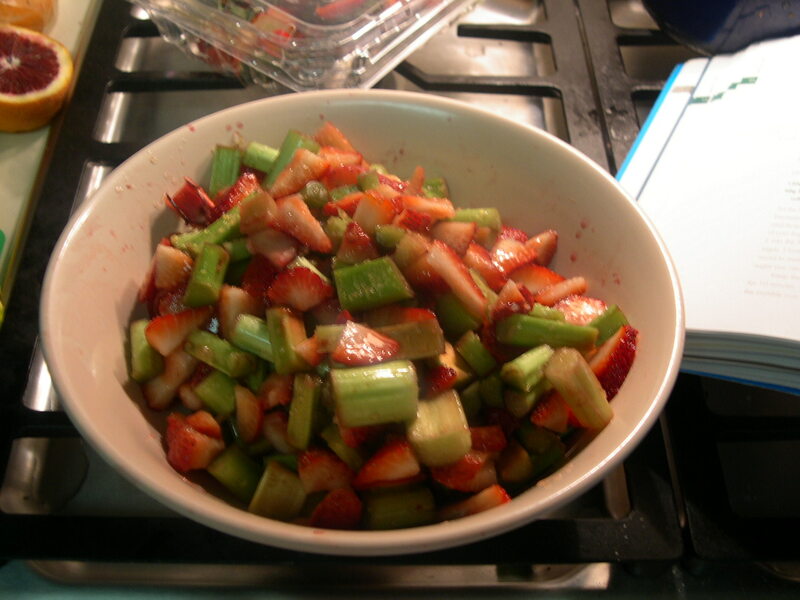 Cut up the rhubarb and the strawberries. The recipe called for 1 kg of rhubarb and I had only bought about 1 pound. I obviously didn’t proceed far before altering the recipe, but rhubarb & strawberries go together for more reasons than color palette, so the berries made up the other pound or so. Add a couple of tablespoons each of caster sugar and light muscovado sugar. Oops — second stumble: What is caster? What is muscovado? And to think that I used to wonder why anyone would want a computer in their kitchen. How insinuated Google and Wikipedia have become in our lives! Caster is a fine white baking sugar and muscovado is an unrefined brown sugar with a strong taste of molasses. No Muscovado to be found at the supermarket, so relied on turbinated sugar instead (aka Sugar in the Raw) and the plain white processed all-purpose sugar in the cabinet would have to do in place of the caster sugar. Add the sugar, orange zest and some orange juice (a “spritz”, Nigella advised). 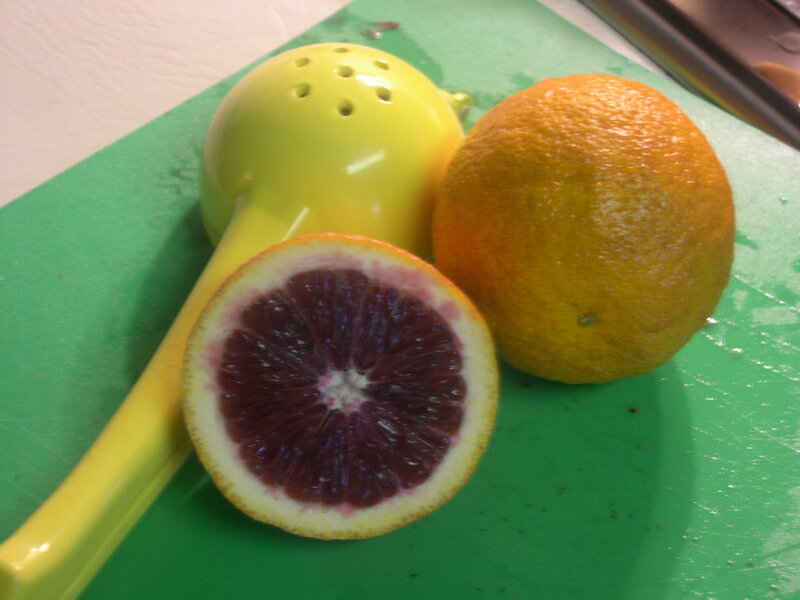 Since I was going to use them in my dinner recipe, I used blood oranges, another Nigella favorite. Since I already had a reddish theme with the rhubarb and the strawberries, I thought the red juice of the oranges fit right in. The recipe calls for oranges, not blood oranges, but the strawberries were very sweet and I thought the tarter taste of the juice would work better. If you aren’t familiar with blood or Seville oranges, Nigella writes that they can be substituted whenever you’d use lemon but want some more color. The color of them fascinates me. I find them a little sweeter than lemons, but they are definitely much more sour than your typical California navel or Florida orange. The crumble crust was simple to make: 120g of self-raising floor, a pinch of salt, 90g of butter, cold and cubed into small pieces about 1 cm, 3 tablespoons of muscovado sugar and 3 tablespoons of sugar or vanilla sugar. I didn’t have any vanilla sugar made either although I did have the beans. Note to self: make some for next time I need it. To spice the crumble crust, I added orange peel, cinnamon, nutmeg and cardamom. Cardamom is my absolute favorite spice. 120g of flour was a little less than 2 cups, 90g of butter was one stick with a smallish slice removed. One standard US stick of butter is 113g. To mix the crust, add flour and salt and butter and mix with your hands. In Nigella’s words: using the tips of your fingers — index and middle flutteringly stroking the fleshy pads of your thumbs — rub it into the flour. Stop when you have a mixture that resembles porridge oats. I don’t know how flutteringly I mixed it, but I did stop when it looked like oatmeal. Keep in the fridge until ready to bake or in the freezer for 10 minutes. Because the fridge was full, it went into the freezer while I made dinner. 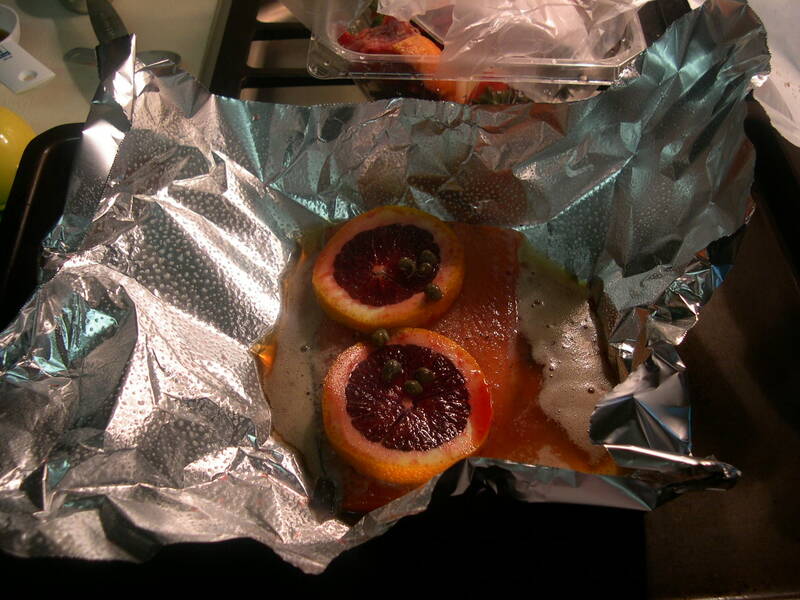 placed in foil packs, with 1/8 c lemon juice, 1/8 c sweet Marsala wine, sliced blood oranges or lemons, & capers. Spray the foil with spray oil. 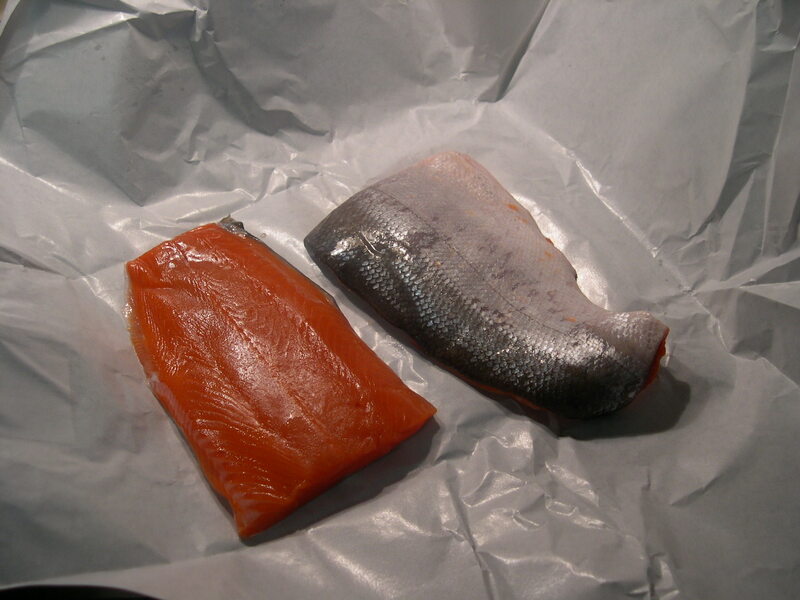 Each fillet goes in its own foil pack. 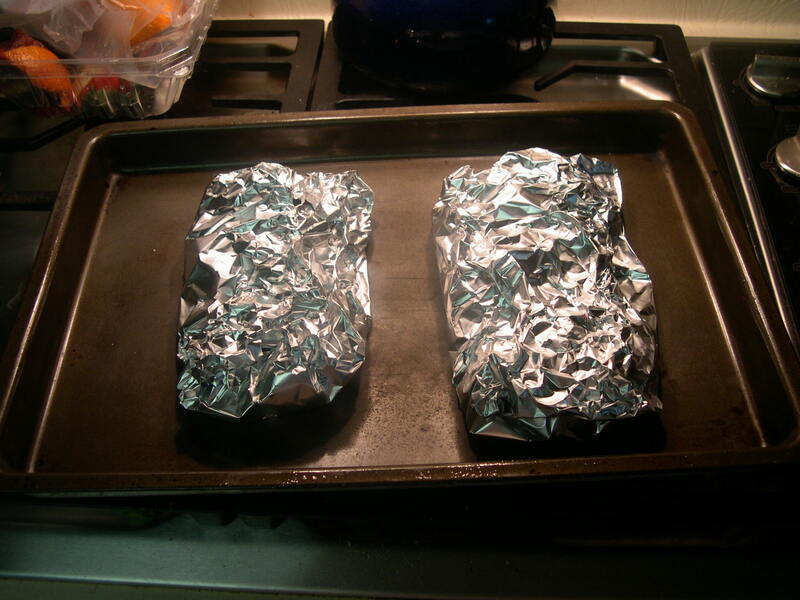 Fold up the foil packs tightly. Place on baking sheet. Cook at 425 for 20-25 minutes. Prep asparagus. 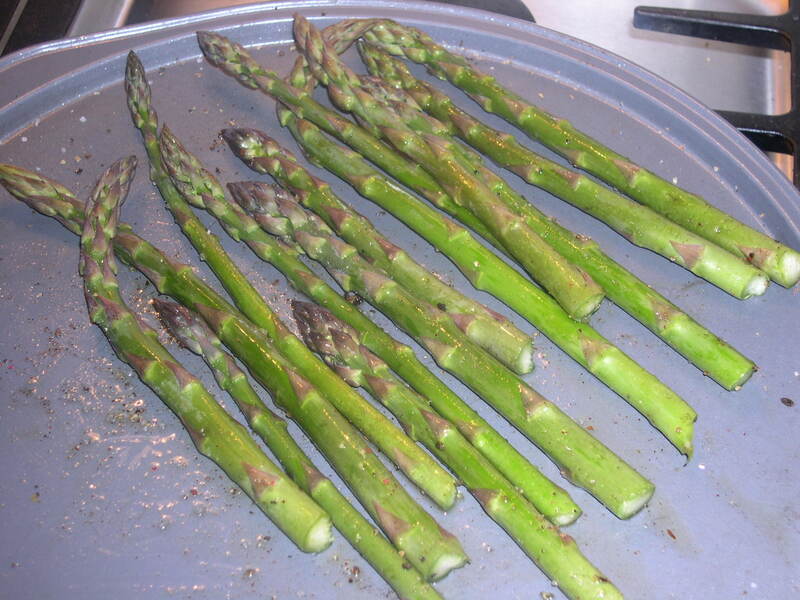 Of course, readers who are asparagus lovers know to break off the stalks near the end, where they naturally break. Spray the tray. Drizzle with good olive oil. Salt. Pepper. And — the secret ingredient I tried today on advice from my friend S (the best non-professional cook I know) — sprinkle with nutmeg. This adds a woodsy but sweet taste to the vegetable. Put in same oven for last 8 minutes the salmon is cooking. During those 8 minutes, drink a glass of wine (see first photo) and try to figure out what the hell Gas Point 5 is on your oven. 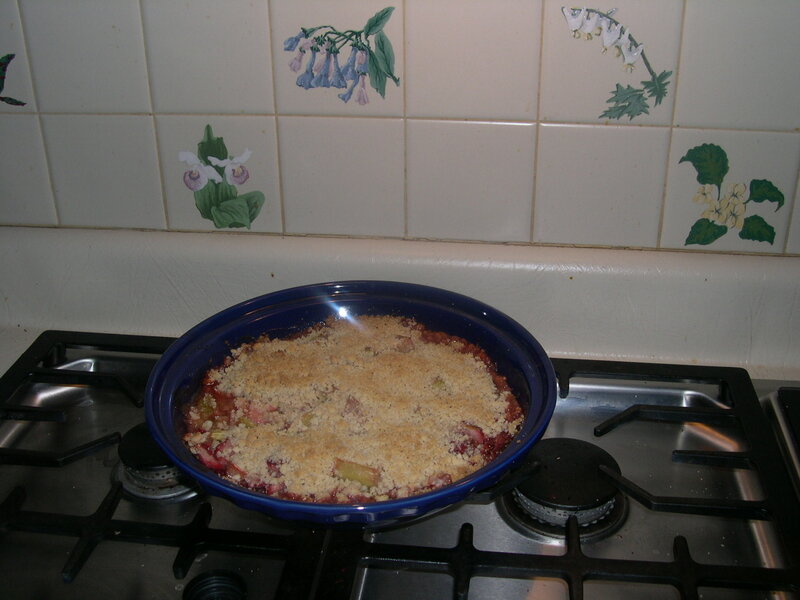 Back to the rhubarb-strawberry crumble: Gas point 5 is 190 – 200C. It took two math whizzes and me debating for a few minutes on how to convert to determine the setting. 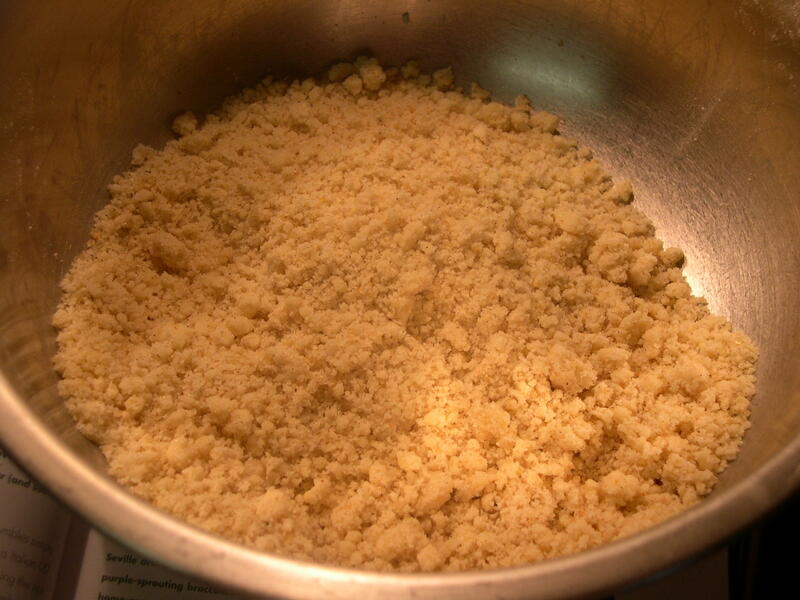 We finally settled on 375 – after the crumble had been in the oven for 10 minutes at 350 (my original calculation). But said oven had been at 425, so I figured it would all even out. Which it sort of did. I baked for 30 minutes instead of the recommended 20-25. It probably could have cooked for yet another 5, as the rhubarb was crunchier than I liked. The crumble ended up being juicier than I liked. I think coating the fruit with a dusting of flour or cornstarch would have been better. I liked the crust a lot. Overall it wasn’t bad. I’d give this recipe a grade of B- because of the liquidity. I’ll try this again sometime with berries or apples or maybe peaches. Doesn’t peaches with cardamom-spiced crumble crust sound heavenly? Although this recipe didn’t turn out picture perfect, I still like this cookbook and would recommend it to cookbook readers and cooks alike. Although the British terms can be new for the American cook, this book, and Lawson’s overall approach to cooking — simple, not much fuss, delicious and pleasurable food — is so accessible. I think that the American version of this book, in addition to the measures, has been edited to include more familiar terms. The recipes are written in a narrative style, rather than an instructional, step-by-step style. While this isn’t the easiest to follow during preparation, each recipe is interspersed with comments by Lawson on the taste, texture or appearance of the work in progress, or maybe with just an aside regarding something about the food. As I was looking for a rhubarb recipe today, I was sidetracked into reading her thoughts on food in season and which food she likes to buy fresh during certain months. Lawson is always entertaining, and frequently tosses in a comment that is sure to make you laugh. Like today, reading her admonition not to mold a rhubarb gelatin in a certain style of mold because, due to its dusty pink color, might come out looking “a bit gynecological”. Ahem! This is not your typical everyday run-of-the-mill cookbook, but it is a cookbook you could use any day. >This is a post about photographs, without any posted here. A few months ago I was having dinner with friends. The conversation drifted to a story involving a deceased friend of theirs, someone I had never met. As soon as someone mentioned their friend, they started telling stories about him. At one point C. asked: “Remember that picture of him & his wife? The one taken at the party?”. “It was the best picture ever,” she said to me, and then she went on to describe it in detail. I felt that I had a great image of the man that my friends missed. Later, I started thinking about the memorable photos I have taken. Could I describe them such that someone who had never seen the photograph could understand the scene, the personalities or breathtaking view captured, the nuanced emotion, the untold story? What about the circumstances behind a photo that seems commonplace? I immediately knew what photo I would choose if asked to describe one photo I have taken that I can remember in detail without looking at it. It had rained most of the morning, but I hadn’t minded it a bit. I had wanted only to be away from my friends. Too many days together on the trip were taking a toll. I needed solitude. I had set out on foot with the map in my daypack, and a roll that I had grabbed as I left the hotel’s breakfast room. I was 19 and it was my first time in Italy, my first time in a country where I didn’t speak the language. Not a word. I didn’t have a plan; I only wanted to walk and to see things through the lens of my camera. I had tired of the tourist spots, so I decided to wander through neighborhoods. The map would only come out of the pack when it was time to head back to the hotel. I spent the morning walking in the drizzle, stopping occassionally to look at store front windows, avoiding the areas where hawkers sold tacky trinkets with images of the new Pope. I aimed my camera at buildings, old men playing bocce, women hanging laundry, flowers, trees, the river. Lunch was a slice of cold pizza bought at a small street market. Around 1 in the afternoon, the rain had stopped and the sun began to appear from behind the departing clouds. The smell of Springtime was in the air: a combination of budding trees and dirt, worms, and wet stone. I wanted to walk along a foot path near the Tiber, but it was too muddy. Instead, I cross a bridge over the river, stopping along the way to snap some photos. When I had crossed, I found some stone steps leading towards the river. As I descended, I saw one of the many feral cats that wandered throughout Rome. I stopped and quietly opened my camera bag to get my telephoto lens. The tabby stared at me as I aimed. A month later, I had returned home and started working. The day I received my first pay check, I went to pick up the 12 rolls of film I had shot. I had forgotten about the cat. When I came to that photo, I was stunned by the image. The stone wall is shades of grey and tan and white, with moss growing between the cracks. Rainwater that had drenched the wall earlier in the day, had dried mostly, with only a few wet trails scattering along the old wall. Evenly spaced along the wall were small openings. Stray plants had taken root in some of them. Dirt, carried by the rain, stained the walls below some of the niches. In the one centered in the frame perched the tabby cat. Sitting regally, enjoying the sun, she seems to blissfully ignore the noise from the street market above the wall, as she yawns. In the next photo, her eyes are closed, her mouth and whiskers stretched into a bored grimace, as if she had just sneezed. The tabby looks like she owns not just her niche in the wall, but the entire wall, the wet bank, and the green river flowing beneath her. A few weeks later I met with my friends to look at the photos from our trip. As I shuffled through R’s photos, I came to a nearly identical photograph of the Queen Cat. “I forgot you were with me that day”, I said. “I didn’t realize we took the same picture of that cat.” And then I remembered that I had been alone. Even though I had wandered without my friends that day, we had been on the same path. I would post a copy of the picture here if I had it. After nearly 30 years, I don’t know if it is in one of the boxes in the basement. But the image is burned in my mind. 1. Pick a photo you have taken or were involved with in some way. 2. Describe the photo and explain the backstory. 3. Let your reader imagine the photo. 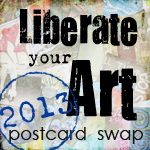 If you want to post it, post it later! 4. Leave a link to your photo description in the comments here. 5. Tag 2 people. I tag: Emily and Bloglily. Posted on November 18, 2007 | Comments Off on >In My Library…. 1. The oldest book in my library: Myths of the Northern Lands, published 1895. 2. The book in my library I’ve owned the longest: St. Exupery’s The Little Prince. I own the copy I read in grade school 38 years ago. I own a copy in French I bought in Paris 28 years ago. 3. The book in my library I’ve read the most : Fitzgerald’s The Great Gatsby. I read this book as an assignment in Jr. High, High School, and two college courses. I taught this book many times too. I’ve lost count how many times I’ve read it. While I wouldn’t say that I know it by heart, I can open to almost any page and by reading a sentence or two, know exactly where in the book I am reading, what action has taken place, understand the tone and nuances of the specific scene, as if I had just re-read all of the preceding pages. 4. The most unusual book in my library: A musty-smelling book with a beautiful hand-painted front cover, a copy of Hawthorne’s Mosses from an Old Manse, found at a garage sale. While I’ve read stranger pieces of writing, the care that went into painting the book, and the neglect that let it molder intrigues me and earns it the ‘most unusual’ nomination. 5. A book everyone should read: whatever informs their lives, enriches their soul, forces them to think, or makes them smile. No tag; you’re it. If you want to do this, feel free. Comments Off on >In My Library…. Last year, I created a survey and asked readers to complete it. It was intended to list the favorite books and blogs of the year, based on the opinions of the readers of this blog. One of the feedback comments I received was: “Do this every year!” So that’s what I am doing! Like last year, the intent is not to come up with the “best” books and blogs of 2007. Instead, it is your favorite things to read. Completing the survey is easy. Just follow this link. There are ten questions, posing questions like “how many books did you read this year?” and “what is your favorite book-related blog?” The survey does not track your IP address, not does it ask for your name. I will, however, when I post the survey results, list the names of those participants who leave a comment here stating that they have completed the survey. The survey is open now. You can complete anytime between now and 12am (Pacific) on December 31, 2007. I will post the results on Dec 31st. >I’m a failure at blog challenges. And I don’t care that I am. Last year, when I started blogging (and blogged regularly, unlike this year…but that’s another post) I was intrigued about the idea of a ‘challenge’. Just trying to read books instead of flat-lining in front of the tv each evening was a challenge to me, but I was curious about this idea of a group of bloggers reading a certain type of book. So I signed up for several challenges and group blogs. And then failed to keep up with the required reading. Oh I had some ‘good’ excuses — behaviors that should have been seen as likely to fail. Like deciding to read The Red and the Black — in French! I had neglected to apply my weight rule of selecting books (a direct inverse relationship between the weight & portability of a book to the likelihood of my reading it) to the LaRousse’s French-English Dictionary, a necessary accompaniment. Don’t think I made it past page 50. Or thinking that I’d read War & Peace, but wanting the paperback version of the Briggs translation not yet available in the US. I carried the copy I picked up in Waterstone’s throughout England and then on to Italy. Had I traveled home 2 days later, I wouldn’t have been able to bring it on the plane due to the terrorist threats, but it wouldn’t have mattered in the long run — I still haven’t read it! Or last year’s RIP Challenge hosted by Carl at Stainless Steel Droppings. That was a challenge that I thought would be challenging since I don’t read horror, Gothic novels or fantasy. I thought it would be good to ‘stretch’ my reading repertoire. I rushed out to the half-priced store and bought 7 books: Hawthorne’s The Fall of the House of Usher, a collection of Poe’s stories, James’ The Turn of the Screw, Neverwhere by Neil Gaiman, the short stories of Washington Irving. Like in the original lyrics to The Ballad of Gilligan’s Isle, I’ll have to add ‘…and the rest’ as I don’t recall the last two and I’m not near my bookcases to confirm the titles. But, participating in the challenge? I didn’t post about one of them! The closest I came was a blog entry, saved in draft form, with the words in the body “Irving. Devil. Tom Walker & his shrewish wife” Obviously, my notes to myself served no purpose as I probably didn’t read them again until today! So, this year I’ve stayed away from reading challenges although many have tempted me, and some have even lead me to consider works I might not have considered otherwise. I easily could have participated in the Non-fiction Challenge, as I’ve read mostly non-fiction this year. At least I met the reading portion of the challenge, if not the blogging portion. And I’ve probably met at least a portion of the requirements for a few other challenges. I started this post thinking I’d write about a book I just finished reading that is indirectly tied to last year’s RIP challenge. If it hadn’t been for Carl, I probably would not have picked up Coraline or anything else by Neil Gaiman. But this post became something other than I intended. And I’m loosing steam with my writing: it’s closing in on the dinner hour and the beach is 10 feet from my doorstep and I think I need to go for a walk. So, maybe I’ll write about Coraline another day. But, in case I don’t, I’ll write this: it’s a fairy tale and a horror story, not just for kids despite it being marketed as such, and is a great way to pass any afternoon reading. I’d recommend it, whether for a reading challenge or not. It would probably be a great story to read to your children, especially during this season of the creepy, the crawly and the spooky. >Now that’s some title isn’t it? Wouldn’t life be simpler if we were all better at stating clearly what we needed? And discerning between what we truly need and what we want? I was told recently that I was receiving lessons in patience and humility. But, to not be so serious, I followed Courtney’s lead in letting Google tell me what I need. The rules are: Type “your name + needs” into Google. Although I got myriad hits the first time, the following list is a blend of various combinations of my name in the search criteria. The results are usually fun, but a few were like horoscopes — could apply to anyone but hit very close to home at this moment. I think I should stick to a spiritual director for guidance on what I need, rather than the Google Oracle! >Recently, I posted a list, a book meme that has been circulating, of 100 selected titles. I commented regarding the oddity of the list. There seemed to be no underlying pattern to the works selected. It contained both classics and popular fiction; high brow and low brow and everything in between. Several commented here or on their own blogs about how eclectic the list was (Anne, Pinky, Gayle, Sassy). Then I came across Myrtias’s blog with a listing from the Modern Library’s identifying their picks for Best 100 Novels. (Danielle posted this list too.) At first I thought I could do the same thing, marking those I had read, those I was unfamiliar with, those that I wouldn’t touch with a metaphoric literary 10-foot pole, those that I owned, as if their presence on my shelves accrued some additional value or meaning. I scanned the list and realized that the stats for my reading (or not reading) was similar for both lists. I had read a few more works on the 100 books meme (23 vs 35) , there were about a dozen works on the Modern Library list that I might want to read in the future (vs 9), those that I was unfamiliar with was about the same (11 vs 15) and there were 5 fewer works on the ML list in the keep at least 10-feet away category. The more interesting thing, though, was to analyze these two lists, not what I had read. There were only 8 works in common (The Lord of the Flies, Brave New World, Catch-22, The Great Gatsby, The Grapes of Wrath, 1984, The Catcher in the Rye, and Ulysses). The first list was dominated by women authors — 42 works by 38 different authors; the Modern Library list had only 9 works by 8 female authors. 42% of the Modern Library list represents 17 authors, almost exclusively male. The ML list does not include works in translation; the first list does (e.g., Tolstoy, Garcia Marquez, Saint-Exupery, Hugo, Dostoyevsky). Maybe the point is, it doesn’t matter who compiles the list. Is the Modern Library list any less esoteric than the other? Like the other list, it reflects a certain perspective, a bias of the list-makers. One could argue endlessly about the makings of a literary canon and the gender biases (or ethnic, cultural, etc. ) of those who establish that canon. I think those discussions are important ones in terms of understanding the inherent biases, but it doesn’t mean that such a list in invalid, only incomplete, or not in harmony with many people’s experiences. I prefer to read “good” works of fiction, but I don’t know that I can define what that is. A trek through my bookshelves would certainly yield an interesting and esoteric list. Some of what I have read is good, some bad, some “trash” that I loved despite not having any lasting value beyond the fun of reading and the actual content of the work forgotten moments after closing the cover. Perhaps it isn’t possible to make a list without some controversy, with an unbiased perspective. But, if the goal is to talk about books, does it really matter? Does it matter if what I consider a good book is different from yours? >Update: Bloglily and I were definitely on the same blogging wavelength, as she made her previous post into a meme too. Same thing, except she has stated that if you don’t post a picture, she’ll come to your house to snap one for you. It’s hardly a threat, as I’m sure she’d arrive with a nice cup of tea for a charming afternoon of conversation. Had I read her post first — and didn’t live ~1900 miles away — I would not have posted the pictures below so that I could be so lucky as to have her knock on my back door. Yesterday, the lovely BlogLily (I’m so glad you’re back, BL) shared a photo of her writing space. When I saw it, I thought: “Of course, BlogLily would write at a wonderful wood table, with a tree blooming out her window. How lovely.” You can see her writing space here. Later, on a blog I recently discovered, Tea Reads, I found a link to articles in The Guardian where AS Byatt, David Hare, Sarah Waters, Hilary Mantel, Beryl Bainbridge, and Michael Frayn shared photos of their writing areas along with a description. I had my inspiration: where I write. Perhaps you’ll play along and describe your writing space as well. My writing space is a sparsely furnished room with a fireplace I haven’t used in years. It has a sturdy old desk of dark-stained oak. An obscure phone number is carved lightly into one side, a ghost of a previous owner. I rescued the desk from a garage sale, its owner claiming that she couldn’t fit it through a door in her newly remodeled home. Years later, I realized that the heavy top is removable with some effort, allowing the desk to be tipped and slid through most doorways. Her loss was my gain. I love the desk’s wide, deep, top that allows me space to write while leaving plenty of area for the detritus that lands on its top: books, magazines, bills, half-forgotten directions to craft projects, stationary. Sometimes I will write at one of the other computers in my house. They are both on the main level of the house, so I am nearer to family activity. But, downstairs in my room, I can still hear life above me: footsteps, the faint drone of the television, doors opening and closing, the washing machine spinning. I don’t need to be in the center to feel the house’s pulse. The lower level room allows me to be nearby, but not in the thick of things. 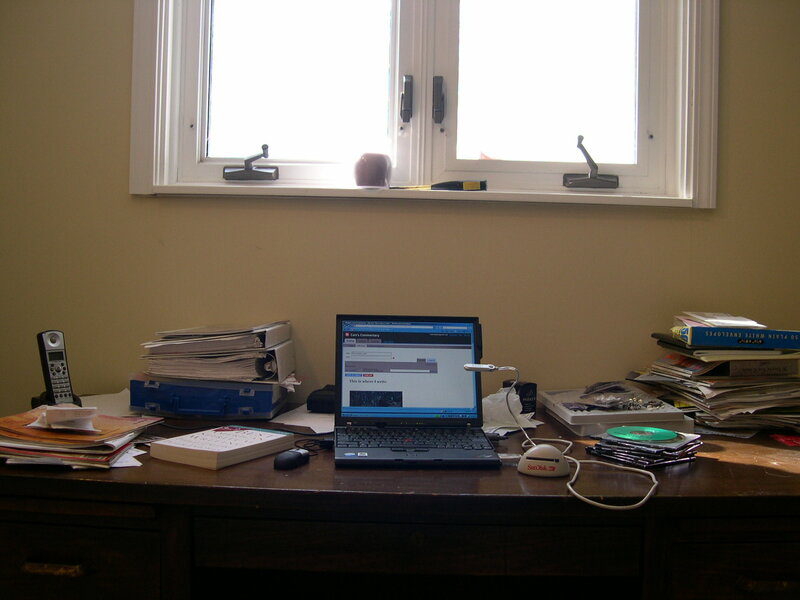 My desk is positioned in front of a window. Right now, all I can see is snow drifts. The window is slightly above eye level when I’m seated, and only about 2 feet above grade. In the spring, I can see the waterside plants around my pond, but I cannot see the water or the fish. If I rise slightly, I can see the waterfall. I can always hear, though, the mesmerizing sound of the falls echoing off of the stone walls. What I can see when I look out the window are the trees that hold up the hill behind my house. Nine months of the year, they mask the nearby neighbor’s house. In the winter, they stand tall, bending gracefully in the wind, a few lone brown leaves still hanging onto branches. There are two giant ash trees that were destroyed by lightening years before I came to live on this wonderful little plot of earth. 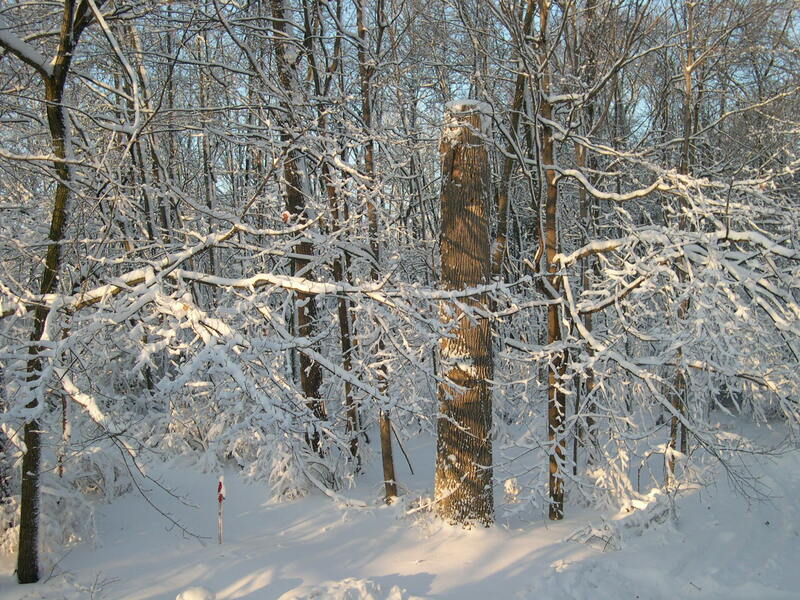 The previous owners chose not to remove the trees, opting instead to cut off the limbs, leaving 20-foot pole-like trunks. The decay of the trees has increased rapidly over the last five years. I know that soon I will need to have them removed, lest they tumble and land on a car or the house or crash down on the stone terrace that separates the pond from the drive. But, they provide a delightful perch for three different kinds of woodpeckers. Cardinals, robins, nuthatches, jays, and wrens also hop up and down the trunks, dining on a gourmet insect feast. In about three or four weeks, the trees will begin to leaf out. 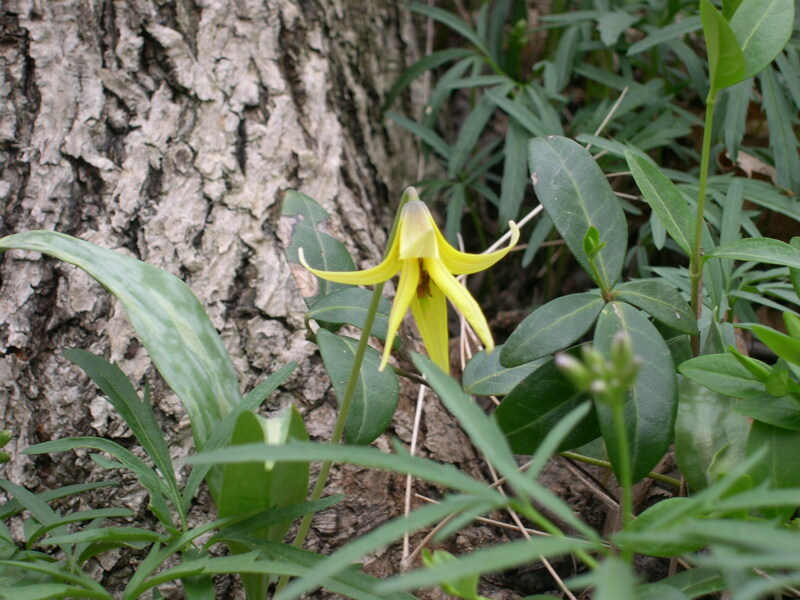 All sorts of wildflowers, most unknown to me by their botanical names, will begin to peep out from beneath the viney carpet of ground cover. White, yellow, and purple stars will shine for a few days, then fade. In mid-April, the may apples will begin to grow. It is one of the oddest flowers I know, growing rapidly, looking like a green leafy mushroom. Soon it will begin to look like a collapsed beach umbrella. As if they were aware of our calendars, the umbrellas open up as soon as it is May, stretching out their leaf canopy until it is almost flat, then displaying one single blossom before settling in for the summer underneath the shadow of the trees. So that is my writing space. Inside and out. 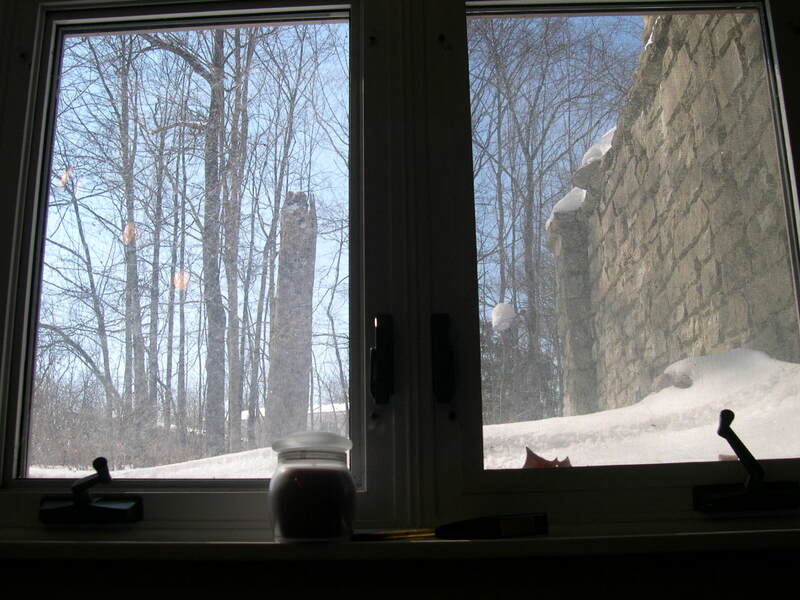 If I’m not at my desk, I’m likely to set up my laptop elsewhere near a window — a necessity both in terms of light and view — looking out at the trees and birds and flowers, nature both my inspiration and a willing participant in any writing procrastination. What about your writing space? Why do you like it? Describe it and its surroundings and share a photo on your blog. Then leave a link in the comments so that we can see where you write. >As I commented on Emily’s blog the other day, I’m committed to not committing to any litblog challenges right now, mainly because, while I’m always eager to join, I rarely follow through. My reading goals for 3, 4, 5 months out aren’t that defined and I like to keep it that way (apparently, even when I say that I will follow a plan). But, when I read Emily’s post about the Non-fiction five challenge last week, I was tempted. I’ve been reading mostly non-fiction lately. This would be an issue goal to accomplish (5 books in 5 months). I resisted the temptation — so far, in a way. Emily listed her selection of 5 books. Included in the list was Barbara Ehrenreich’s book, Bait and Switch: The (Futile) Pursuit of the American Dream. This book is a follow up, of sorts, to Ehrenreich’s book Nickled and Dimed, in which she wrote about the plight of minimum wage workers (if you haven’t read this book, read it now). In Bait and Switch, she writes about unemployed and underemployed professional workers squeezed by corporate downsizing. I bought this book (now in soft cover) when it was first published, around the time that I was laid-off. It was a situation where I knew for weeks that my job would end, with parting gifts available if I stayed until “the end”, but no guarantee of when that end would be. No severance pay if I left before the undefined time, a shoddily written contract (I’m not a lawyer, but even I recognized that it was contradictory, contained blanks, shouldn’t have been signed) that may not have been enforceable, but I live in a ‘right to work’ state where the rights of employers almost always win out over the rights of the employee. But I never read Ehrenreich’s book. Unlike most people in similar situations, I was extremely lucky and landed in a new job within a few weeks, only to have that job end in a few months when a major cancelled contract left my employer with no funds to pay his staff. Two more long-term contract jobs and two years later, I’m finally in a permanent job. But I still haven’t read Ehrenreich’s book. Now is the time. Emily and I have agreed to post on this book on April 4th. If you’re interested in reading this book, join us in posting about it on that date. No further commitment needed. Since publishing Bait and Switch, Ehrenreich has helped to form an organization for middle-class professionals, United Professionals. Ehrenreich also has a couple of blogs, Barbara’s Blog, and Barbara’s Guest Commentators. Always interesting reading. I’m also looking forward to her latest book, Dancing in the Streets: A History of Collective Joy, scheduled to be published in July, 2007. BTW: For info on the official “Non-Fiction Five” challenge, go to Joy’s site, Thoughts of Joy, for details. Emily found this challenge at Heather/Orange Blossom Goddess’ blog, The Library Ladder.